The Assignment: Make your own drum machine sounds, do something with them, and share them. Major thanks to Matt Nish-Lapidus (@emenel) and Jason Wehmhoener (@jasonw22) for helping put together this project. Step 1: Today is August 9th, meaning yesterday was August 8th, or as it has come to be widely named: 808 Day, celebrating the Roland TR-808. In slightly belated celebration of that day and that device, we’ll be devising our own drum machines. Step 3: Based on your thinking from Step 2, create those dozen or so sounds that are the basis for your imaginary drum machine. 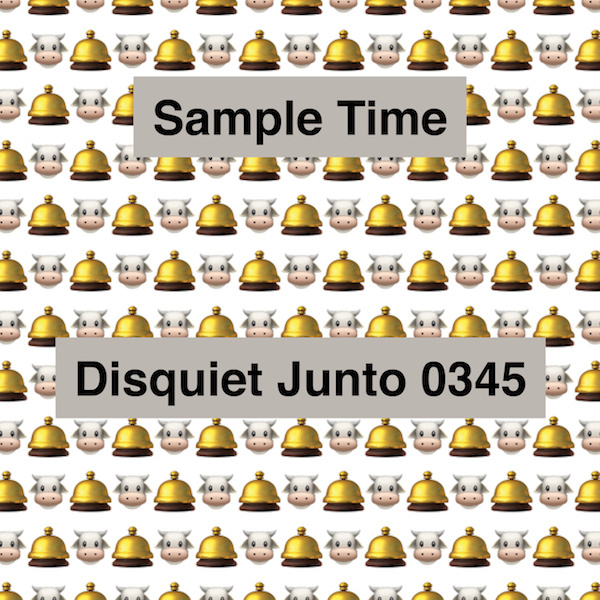 Step 1: Include “disquiet0345” (no spaces or quotation marks) in the name of your track. Step 2: If your audio-hosting platform allows for tags, be sure to also include the project tag “disquiet0345” (no spaces or quotation marks). If you’re posting on SoundCloud in particular, this is essential to subsequent location of tracks for the creation a project playlist. Step 4: Post your track in the following discussion thread at llllllll.co. Step 5: Annotate your track with a brief explanation of your approach and process. Deadline: This project’s deadline is Monday, August 13, 2018, at 11:59pm (that is, just before midnight) wherever you are on. It was posted in the afternoon, California time, on Thursday, August 9, 2018. Length: The length of your track is up to you. Title/Tag: When posting your track, please include “disquiet0345” in the title of the track, and where applicable (on SoundCloud, for example) as a tag. Download: It’s important for this project that your track is set as downloadable, and that it allows for attributed remixing (i.e., a Creative Commons license permitting non-commercial sharing with attribution). Major thanks to Matt Nish-Lapidus and Jason Wehmhoener for helping put together this project. There’s also a Junto Slack. Send your email address to twitter.com/disquiet to join in. The project is now live. Ive always been huge fan and addicted user of the TR808, particularly in the 90’s, love this assignment but I’m not able to build my own Proto-808 sample set as I would love to. Another track my vaults, this is an old producer"s call for music made using household objects, here is metallic stuff, pans and pots from my kitchen, a stainless steel Thermos, Ikea trash lids and my metal desk lamp. Played with my fingers , mallets and brushes. I made a 5 part suite, this is Part 2. My kit consists of samples of a previous Junto project, where I vocoded the drum break from James Brown’s “Cold Sweat” through yet another previous Junto project, an ambient textural thing. I transposed and stretched a few of the samples for timbral variety. First, you hear each of the sixteen drum sounds. Next, there’s a pattern made by programming the kit in a conventional way. This is joined by a texture made by pitching and stretching the kick drum extremely. There’s another layer of the kit with a big dub echo on it. Finally, there’s a texture made by shifting the whole kit up an octave, putting a randomized arpeggiator on it, and running it through lots of echos and filters and such. For this week’s contribution I utilized a Roli Block to Play a drum rack I built in Ableton 10 ,with clips captured prior, then sliced them with in the drum rack. I layered with the Ableton 808 Drum Rack on a second MIDI Track. Used the looper to capture a few bars and play in reverse looped thru the track at various tempos. Added PingPong Effects, Compression on a Group of 2 drum racks captured with Waves MAXX BaSSS plug in, then overall Compression. If you haven’t seen the 808 Film get on that! I enjoy capturing non-traditional instrument sounds to use. I like to play with not only how they sound but how they feel on your hands when you make the sound or if it induces tingles. I am glad your obsessed with echo, you might get lonely without a response. The title however has me longing for Tacos! It’s a dance party in the kitchen! (my kids say thanks!) Do you have a taco track? Second piece for the disquiet junto. The challenge this week was to create our own drumkit to celebrate 808 day. I’ve been spending the last 2 weeks re-orchestrating the “Odysseus : Live” project (https://vimeo.com/219463860) for chamber orchestra, synths, and 4 voices, so I’ve been listening to Luka Lesson’s beautiful tones every day. The piece starts with a short quote from the very opening of the show, which I then sampled and processed to create the drum kit. A percussion-like sample pack was created and can be found in the first 10 seconds of this track. Almost the whole song is constructed just using these sounds. Most of the sample pack is made up from field recordings of large machinery. A Gameboy was also sampled. To tie it together a little, two subtle layers of ambience were added along with a MinimogueVA. Indeed, mirrors delays and echoes are great, loyal and understated companions for a lonely soul. Your track ans samples are awesome, bravo! 03:01, eyes are burning, on call and probably spent way too much time on this. With an excellent prompt on one of my favorite parts of music making, you’d think piece of cake. Well maybe that’s the problem, I love kits, drums, rhythms, pads and most anything percussive in nature. It was my first instrument and still plays a large role in most of what I do. So it’s possible a little too much enthusiasm and importance was put into this kit. I had thought of using one of the many already in my arsenal, but thought that wasn’t in the spirit of this weeks Junto. Opening my recorded samples folder started the process. Each kit sound was made in Cubasis, mixed down and sent to Audioshare, trimmed and normalized for use in any sampler or DAW kit. The entire kit was given a small drum room overhead mic reverb and levels were mostly equaled out with all panned center where recordings allowed. Of course the obvious choice was going to be very beat driven, so the above sounds were brought into Patterning 2 for a custom kit perfect for live manipulation! A 4/4 135 bpm file was created and live pad view opened. It started innocently enough, but went out of control into a 10:00 jam with ratcheting counts and delays and tunings and swing all being messed with. It got ugly and noisy. Perfect, but too long and dull for normal consumption, so the best bits were sent to play with a raucous Sunrizer patch. And crickets. And a badly done building chorus. All with overdriven amp patches and distortion and noise. You get the drift. It was late, the beat sounded good and it all went wrong If anybody is using Patterning and interested, I can try uploading? This one started and ended differently. I started by using the modular to synthesize a bunch of electro-dubby percussion, but then samples some Rhodes notes in with the idea of doing… something. But then I got carried away with re-pitching, stretching, and composing the rhodes samples into something more, and then the “other” drums I made just sounded like bad late 90s chill-out, so I erased those, synthesized a new kick on the modular, and stripped down the rings samples I had been working with. A minimal drum machine, consisting of a kick and a snare(ish). Thanks!!! Yeah right now it’s only implemented to recognize mouse clicks. (Touch recognition is a whole different thing.) Volume, tempo, and swing adjustments are hopefully coming very soon! My drum machine sounds were all recorded 2011-3, when I was making music with playgrounds in and around Leeton for the centenary of that town. An album of those recordings can be found here. You can see the two different types of contact microphones that I used, one the cheap clamp-style sort usually used for instrument tuners and the other were piezo sensors placed on matchsticks. There’s an overview of how to make the latter here. It’s been interesting to revisit the playgrounds. I should record more. I’ve uploaded my track here if anyone wants to use my sounds for the Junto next week. Kitchen Sinkology is a trio for violin, cello, and a drum kit sampled from nearly two dozen sounds in my kitchen. Knives chopping, cabinet doors opening and closing, oven and microwaves beeping, pots clanging, aluminum cans crunching, plastic bags rustling, and more. All these sounds are in the drum kit but not all made it into the final mix. The drum patterns I used were borrowed and tweaked from the MIDI clips included in several Ableton Live add-on packs. I tried to keep the violin and cello parts relatively simple to allow the listener to hear more of the percussion parts. For those interested in using my drum samples, the audition at the beginning plays the dry samples in General MIDI note order starting at C1 (Bass Drum). Assigning the kit to a GM-mapped drum sequence stands a pretty good chance of sounding decent. I initially recorded a bunch of modular synth percussion patches but I didn’t find them very exciting. So I recorded a coin spinning, a cow bell, hittings two sticks together, a crunchy noise, a rattle, some cables knocking on a mic stand, a thumb piano and a few bangs and scrapes on my gong. I also ended up using an 808 kick. For the tune I added some gas bottle percussion and guitar and then doused everything in a lot of delay and reverb. Getting the samples tuned and eq’d to sit right was a bit tricky. Not really a sing a long, maybe it could work for a scene in a film. used the infinite drum machine ( https://experiments.withgoogle.com/ai/drum-machine/view/ ) to get 16 random sounds - things like human grunt, cardboard box, cloth on concrete, compressed air burst, tambourine, dog woof.